﻿Photography is popularly taken to have been invented in 1839, when the commercially-produced “daguerreotype” became publicly available , though earlier prototypes had been developed in the 1820s by Niepce, to whom some credit for the invention may properly belong . Other processes for the reproduction of images, without the crucial chemical fixing, had long been available through the use of the simple “camera obscura”, and the more complex “camera lucida” patented in 1807. This article examines the impact of the invention on one of the most traditional of visual media – the art of painting. The article is confined broadly to Western painting in the period from the announcement of the invention in 1839 up until round the end of the nineteenth century. It is a companion to The ‘New’ Time in Painting, which examines the impact that changing concepts of time had on painting, particularly in the 20th century. Some of the concepts are of course similar and some duplication has been preserved to enable each article to be self-contained. _ Identifying that an influence exists, and evaluating its significance, is essentially a counterfactual exercise, with all the pitfalls that this entails . As photography and painting were both developing contemporaneously, care must be taken to distinguish causation and mere coincidence or parallelism. This is particularly so, given that many photographs themselves mimicked painting styles . To establish that an influence exists, therefore, it is not sufficient to demonstrate mere similarity. A similar result can be coincidental, or arise from two or more quite different causes. Similarity can also result from the obvious consideration that the subject matter of both a photograph and a painting may simply be the same. For example, the fact that a photograph and a painting of a person each show the person in a characteristic pose proves little, if anything. In fact, it would be more surprising if both portraits were not similar . Questions of timing can also be crucial – there have been examples of situations where it has turned out that a painting in fact preceded the photograph on which people had erroneously supposed it was based . Furthermore, although it may be relevant that a painter is enthusiastic about photography, or acquires or takes hundreds of photos, that is not enough – in itself – to show that photography influences their painting (or vice versa). Overall, in an area such as this where there are many grey areas and opinions can differ, statements expressed with certainty are not always justified and may not even be desirable. In evaluating the significance of an influence, one must take into account various factors – its directness, its distinctiveness, how widespread it was, how long it lasted, the importance of the aspect which was influenced, and the significance of the painters who were influenced. A conclusion about the influence of painting taken in 1890 will almost certainly be different from a conclusion made a hundred years later, as the painters considered “significant” may vary dramatically at those different times . _ At the time when the invention of photography was announced, the art world was in somewhat of a trough . The more formal academic style of painting based on Classicism was generally in slow retreat, and Romanticism had lost its initial impetus. However, some trends toward realism were emerging, or about to emerge, with the Social Realists in France, the Pre-Raphaelites in England and the landscapists in America. Reactions to the invention varied widely. On one hand, there was wide-eyed astonishment and enthusiasm. An 1840 Australian newspaper exclaimed, “An invention has recently made public in Paris that seems more like some marvel of a fairy tale or delusion of necromancy than a practical reality... The thing seems incredible”. Ruskin described daguerreotypes as "glorious things" and “the most marvellous invention of the century”, likening photography's effect to a magician enabling reality to be "carried away into an enchanted land" (though he later modified his enthusiasm)[10A]. Edgar Allan Poe described it as "the most important and perhaps the most extraordinary triumph of modern science" [10B].The Journal of the Royal Photographic Society, perhaps predictably, declared, “Photography is an enormous stride forward… The old world is well nigh exhausted with its wearisome mothers and children called Madonnas, its everlasting dead bodies called Entombments, its dead Christianity and its deader paganism”. At the other extreme, there was outright denial and hostility. One outraged German newspaper thundered, “To fix fleeting images is not only impossible … it is a sacrilege … God has created man in his image and no human machine can capture the image of God. He would have to betray all his Eternal Principles to allow a Frenchman in Paris to unleash such a diabolical invention upon the world”. Baudelaire described photography as “art’s most mortal enemy” and as “that upstart art form, the natural and pitifully literal medium of expression for a self-congratulatory, materialist bourgeois class” . Other reputed doom-laden predictions were that photography signified “the end of art” (J.M.W. Turner); and that painting would become “dead” (Delaroche) or “obsolete” (Flaubert) . In between these two extremes, there was a wide range of mixed feelings. Some people expressed disappointment about the fact that there was no colour, no real capacity to show action, and that the daguerreotype itself (as distinct from the calotype) was not reproducible. The London Globe simply concluded: “We doubt whether the contribution to art will be of much importance”. Some painters, such as Courbet, welcomed photography as an ally in his reaction against the classical academic style. Many others, however, who had spent years learning their craft, felt disdainful of a commonly-available mechanical device that lacked the painter’s trained discriminating and expressive eye. At the same time they were aware of the challenge that it presented. This mixture of outward disdain and inner dread meant that many painters would often be reluctant to admit to actually using photography in their work. 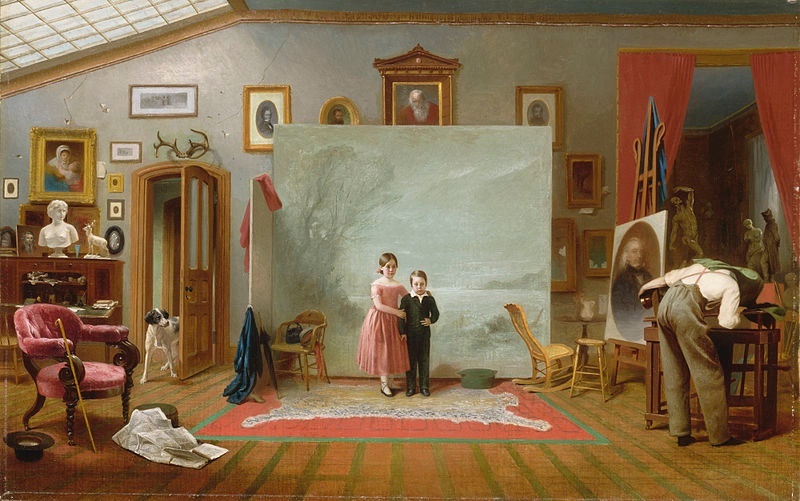 ﻿Some of the ambiguities and uncertainties that surrounded painting’s early relationship with photography are well reflected in the scarcity of any nineteenth century paintings featuring photography, even incidentally. This absence may reflect antagonism, denial, or simply disinterest on the part of painters. Similarly, it was unusual for pre-photographic painters to depict the camera obscura [15A]. Another curiously oblique representation may be provided by Manet’s Luncheon in the Studio (1868). On one idiosyncratic interpretation, based on X-rays and an iconographic analysis, the painting shows Manet (allegedly represented by his son, Leon [17a]), standing in the centre of a photographic studio beside Baudelaire (represented by a badelaire, or French sword) and “photography” (represented by a silvery jug). Manet is thus said to unite the picture space between the fleeting moment (represented by a puff of smoke) and permanence (represented, rather anti-climactically, by a rubber plant). However, drawing conclusions from this type of analysis seems a particularly subjective exercise . An actual camera also features, rather incongruously, in a ceiling fresco by Ludwig Seitz  in the vault of the Galleria dei Candelabri at the Vatican. This work was commissioned in the mid 1880s by Pope Leo XIII, reportedly a fan of photography. The fresco depicts personifications of the various arts paying homage to Ecclesia, the representative of the Church. But although the work was nominally intended as the Pope’s personal tribute to photography, the upper realm is restricted to the painting, architecture and sculpture, while photography is relegated to an inferior position, lower right, next to weaving. Its actual depiction also is less than convincing – a putto is pointing an incongruously bulky camera rather randomly into space. Clearly, even in a supposed tribute, photography’s role is still regarded as subsidiary . 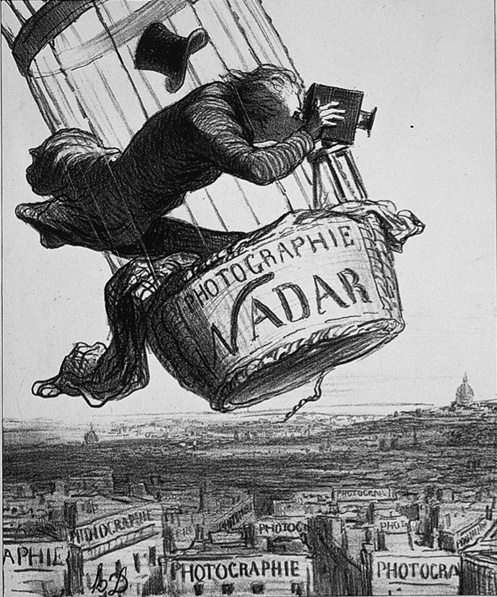 Outside painting, photography’s lofty aspirations to transcend its lowly realm were also the subject of Daumier’s satiric lithograph Nadar elevating photography to the level of art (1862). Here the artist appears to suggest that such an elevation was so difficult it could only be achieved with the assistance of a hot air balloon. Photography’s rapid commercialisation  meant that many painters – or prospective painters – were tempted to take up photography instead of, or in addition to, their painting careers. Most of these new photographers produced portraits. As these were far cheaper and easier to produce than painted portraits, portraits ceased to be the privilege of the well-off and, in a sense, became democratised . Some commentators dismissed this trend towards photography as simply a beneficial weeding out of second-raters. For example, the writer Louis Figuier commented that photography did art a service by putting mediocre artists out of business, for their only goal was exact imitation. Similarly, Baudelaire described photography as the “refuge of failed painters with too little talent”. In his view, art was derived from imagination, judgment and feeling but photography was mere reproduction which cheapened the products of the beautiful . While there is probably an element of truth in these views, they do not tell the full story. Many artists did not feel any obligation to starve for the purity of their art, no matter how elevated that art may be. As Holman Hunt pointed out, “many [painters] turned their steps towards photography and businesses connected therewith, and thus found a much more tranquil career and oft-times ampler fortune” . Apart from the temptations for existing painters, there would of course have been an unidentifiable number of potential artists who chose photography instead of painting. The impact of this is impossible to assess. Photography had particularly dramatic effects on the livelihoods of painters who operated on the fringe of the mainstream. This included the portrait miniaturists, whose markets fell drastically, particularly after the introduction of the multi-pose and cheap cartes de visite in the mid-1850s. Many gave up, while others turned to colouring photos . Some painters of sentimental genre scenes were also particularly affected, as a result of the profusion of readily available photographic genre works, often composed in a painterly or "pictorial" style . This was sometimes due not to the public’s preference for the photographic version, but simply because a particular subject matter lost its appeal to painters and their clients once photography entered the scene . In addition, the introduction of “half-tone” photography in the 1880s also initiated a slow decline in the market for newspaper and magazine illustrators . The advent of relatively quick, cheap and accurate photography also contributed to the eventual disappearance of the itinerant or journeying artist who travelled round the countryside, materials in a haversack, ready to decorate a farm wagon, paint an inn sign or execute on-demand portraits of people and pets, wedding scenes, and the staff in stately homes. These artists were particularly susceptible to competition, as many had little or no training and their standards were variable. For example, the remarkable uniformity of many portraits by itinerant artists contributed to the myth of the “headless body”, according to which artists desperate to save time would arrive in a town with several canvases on which were painted generic torsoes, with only the head of the sitter to be completed . Some of these artists were able to hold out against the trend . Far more typical, however, was the life cycle of one William Atkinson, who started his working life as an itinerant portrait painter, later adding photography to his business by establishing two photographic studios, and then finally abandoning painting altogether to became a full-time photographer . In America, by contrast, itinerancy was more highly regarded as an example of resourcefulness and self invention . This, coupled with the wide open spaces and greater isolation of people, meant that itinerant artists were able to postpone the inevitable for a few more decades than in Europe . Go now to Part 2 "Photography as a working aid"
1. The daguerreotype, named after its inventor Louis Daguerre, was quickly followed (but not superseded) by Fox Talbot’s “calotype”, which was printed on paper (instead of a silvered copper surface), had less precise definition and was less durable, but could produce a “warmer” effect and – importantly – could be reproduced. For more on the invention see our separate article. 2. Niepce died in poverty in 1833. His prototype “heliograph” View from the Window at Le Gras (ca 1826) disappeared in 1900 and was only rediscovered in 1951 (Koetzle, H-M, Photo Icons: The Story Behind the Pictures 1827-1926, Taschen, Cologne, 2002). See also note 130. 3. The camera obscura was certainly used by some painters, for example in the city vistas of Canaletto and Bellotto (see our article on the reconstruction of Warsaw). However, the actual extent of this use (and its significance) has become somewhat of a controversy in recent years: see Hockney, D, Secret Knowledge: Rediscovering the Lost Techniques of the Old Masters, Viking Studio, New York, 2001; Boztas, S, “Hockney Pet Theory Challenged”, Scottish Sunday Herald, 22 August 2004. 4. See generally Ferguson N (ed), Virtual History: Alternatives and Counterfactuals, Picador, London, 1997. 5. A very early example of this is provided by Fox Talbot’s photograph The Open Door (1844), which he consciously modelled on seventeenth century Dutch genre painting. Another is the 1850s photographic landscapes of Gustave le Gray, which echoed paintings of the Barbizon school of painters. For a full treatment of the influence of paintings on photography, see Dominique de Font-Rėaulx, Paintings and Photography 1839-1914, Flammarion, Paris, 2012. 6. This is particularly so if the photographer either trained as a painter, or if the consumers of his products were artists (Jacobsen, K, Odalisques and Arabesques: Orientalist Photography 1839-1925, Bernard Quaritch Ltd, London, 2007 at 74). 7. The painting in question was Munch’s Self Portrait with Brushes (1904); the photograph was a portrait taken in 1905/6 (Eggum, A, (transl Birgit Holm), Munch and Photography, Yale University Press, New Haven/London, 1989, at 90). 8. For example, an observer in 1890, without the benefit of hindsight, may possibly have particularly valued painters such as Vernet, Delaroche and William Powell Firth – very popular and extensively reproduced in their day, but relatively ignored today – while still despising Manet, scoffing at the Impressionists and ignoring van Gogh. Similarly, the significance of a current-day conclusion that Manet was influenced by photography will substantially diminish if, for some reason, Manet subsequently falls out of critical favour. 9. Bazin, G, A Concise History of Art, Thames and Hudson, London, 1958, at 393. 10. Quoted in Newton, G, Shades of Light: Photography and Australia 1839-1988, Australian National Gallery, Canberra, 1988, Introduction. It did not take long for the "marvel' to reach Australia -- the first photograph taken in Australia was in May 1841: O'Flahertie, S, (ed) Celebrating 100 Years of the Mitchell Library, Focus, Sydney, 2000 at 76. 10B. Alexander's Weekly Messenger, January 1840. 11. Maas, J, Victoran Painters, Barrie and Jenkins, London, 1978 revd edn, at 190. 12. Freund, G, Photography and Society, Gordon Fraser, London, 1980 at 67, quoting the Leipziger Anzeiger from 1839. 13. Thomas, A, The Expanding Eye – Photography and the Nineteenth-Century Mind, Groom Helm, London, 1978, at 8. 14. Landseer also punningly described photography as a “foe-to-graphic art” (cited in Maas, op cit at 194). 15. Hendricks, G, Eadweard Muybridge: The Father of the Motion Picture, Grossman, New York 1975 at 206. 15A. One notable example was Charles A Philippe van Loo’s The Camera Obscura (1764) (aka The Magic Lantern). 16. This concern was particularly being felt by many American artists at a time when the American art market had collapsed as part of the economic recession that followed the Civil War. 17. Conrads, M C, “American Stories: Paintings of Everyday Life 1765-1915”, Exh Cat, Metropolitan Museum of Art, New York, 2009; see also Viele, C, “Flames to Fame – the Sidway Double Portrait 1865”, Western New York Heritage, Winter, 1999. 18. Ligo, L, “The Luncheon in the Studio: Manet’s Reaffirmation of the Influence of Baudelaire and Photography upon His Work”, Arts Magazine, LX 1/5 (Jan 1987) 46. See also note 131. 19. This work has also been attributed to Domenico Torti. 20. Spear, B, “Homage to Photography”, History of Photography, 3 (1979), frontispiece; see also Smith, G, “Art photography” in Encyclopedia of Nineteenth-Century Photography Vol 1, Routledge, New York, 2008, at 74. 21. In Great Britain, for example, the 1851 census include just 51 photographers, but just ten years later this figure had grown to 2,879 (Thomas, op cit at 19). See generally McCauley, E A, AAE Disderi and the Carte de Visite Portrait Photograph, Yale University Press, New Haven/London, 1985. 22. Freund puts this at its highest, arguing that photography was actually the product of the rising middle classes’ increasing “need for a new form of artistic expression”, in the form of portraits (Freund, op cit at 9, 69). As Galassi points out, this type of argument has its difficulties, as “hindsight too readily concludes that the early uses of photography satisfied needs that existed before its invention” (Galassi, op cit at 11). 23. Rubin, J, Impressionism and the Modern Landscape, University of California Press, Berkeley, 2008, at 43, 45-46. 24. Maas, op cit at 190. In England, for example, defectors included eg Sir William Newton, Henry Peach Robinson, Oscar Gustave Rijlander and Philip Delamotte. French examples included Charles Negre, Henri Le Secq and Gustave Le Gray (Vaizey, M, The Artist as Photographer, Sidgwick & Jackson, London, 1982, at 19, 20). The portrait painter/engraver Thomas Bock, who successfully turned to photography in 1843, is an Australian example: see “Thomas Bock portrait of two boys”, artonview, 61 Autumn 2010, National Gallery of Australia, at 40. 25. Scharf, A, Art and Photography, Allen Lane, London, 1986, at 43; Gaskins, W, “On the Relationship between Photography and Painting in Australia 1839-1900”, PhD thesis 1991, at 97. 26. Examples include Henry Peach Robinsons Day’s Work Done (1877) or Fading Away (1858), which one can readily visualise from their titles alone (Maas, op cit at 201). 27. For example, soon after the style of “moonlight over water” paintings, exemplified by British artists such as Atkinson Grimshaw, was paralleled by Frank Meadow Sutcliffe’s atmospheric photographs of similar subjects, the artistic tradition withered away (Maas, op cit at 202). 28. See also note 135. 29. Website of the American Folk Art Museum at http://www.folkartmuseum.org/index.php?id=1522) . 30. For example, it is reported that one Rufus Porter, journeyman artist, was confident enough to advertise “No Likeness, No Pay”, though his confidence was no doubt fortified by his enthusiastic use of a camera obscura (Groseclose, B, Nineteenth-Century American Art, Oxford University Press, Oxford 2000, at 37). 32. In America, many other professions – peddlers, farmhands, ministers, even lawyers –adopted the practice of travelling to their market rather than waiting for the market to come to them. 33. Groseclose, op cit. For the Australian experience, see Tim Bonyhady, The Colonial Earth, Melbourne University Press, Melbourne, 2000 at 192ff.